Firstly I should start this letter by apologising to you for not writing you a little note for absolutely ages. I looked back at my letters to you thinking that the last one I would have written to you would have probably been your last birthday, but I am embarrassed to say it was even longer than that. I last wrote to you at two years and seven months which is just crazy. Life goes by so quickly and I used to be so frequent with my letters to you all, but inevitably as you grow and get bigger, and we get busier, it just seems to happen only ever so often. Still I hope that you will look back on my letters I have written to you, and indeed all the photos, videos and memories on this blog, and be thankful I documented your life when you were little. You will be able to see just how loved you were. And for such a little girl, you take up such a huge space in all our hearts. Last week you turned four. FOUR. I can’t believe it. 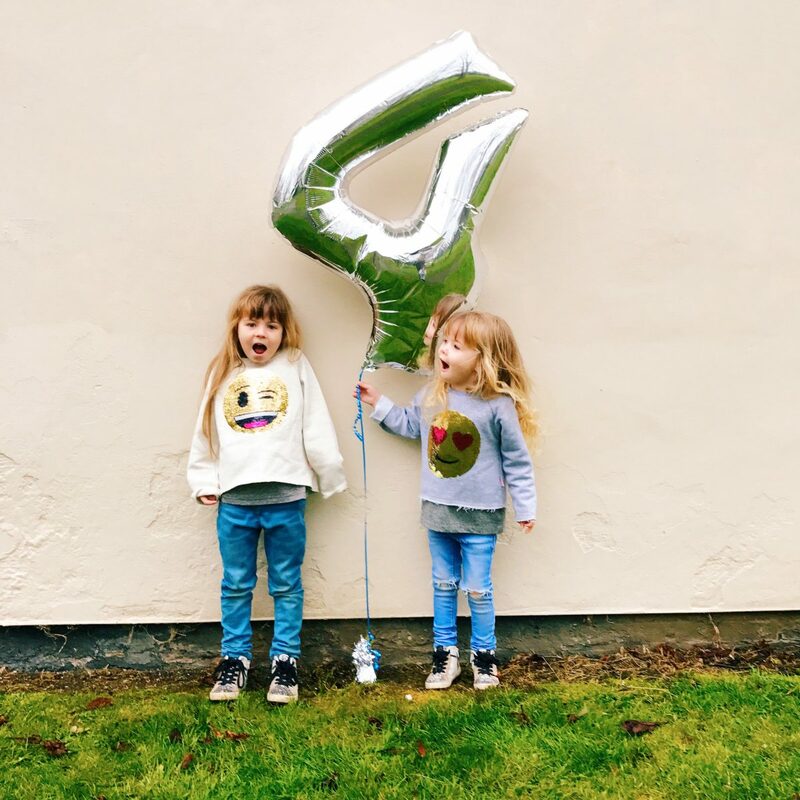 I know I always say that, it’s almost as if every birthday or big milestone has to arrive with me exclaiming that I just can’t believe it and that time goes so very quickly, but it is true. It’s a cliche to say it but it does. 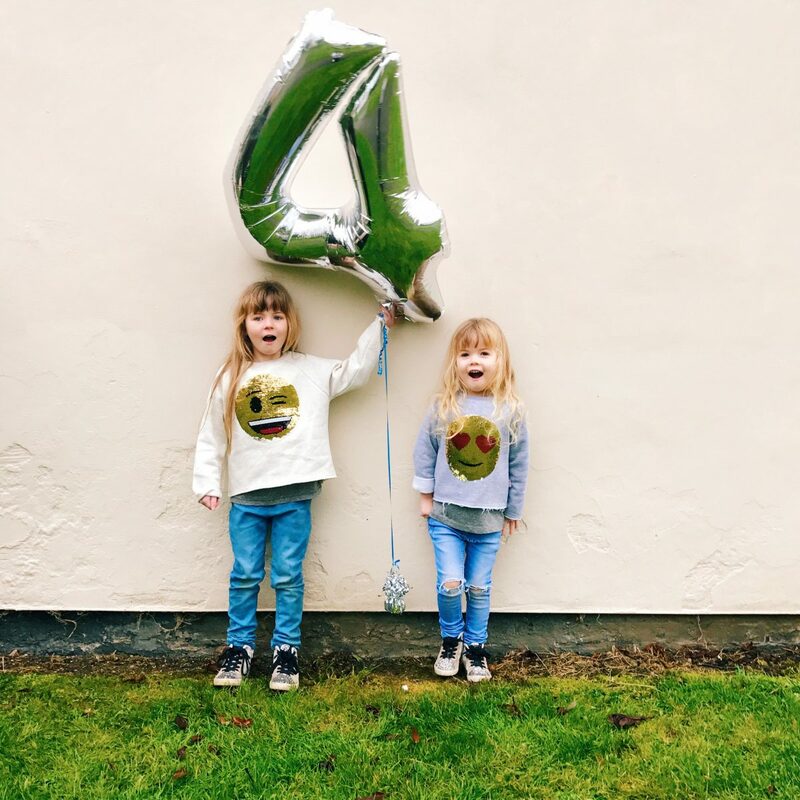 On one hand there is no way I could even slightly imagine life without you now, yet at the same time it is hard to comprehend that my baby girl is four. You are quite a little girl, although you are tall and lanky like your sister, in personality you are still very much more like a toddler. You have only really just got to grips with fully talking, and you are still so quiet- in fact I wonder if you will need a little bit of speech therapy when you start school, nursery haven’t mentioned it, but occasionally a little stutter comes out and you still are very quiet. I think part of that is having your very vocal and loud big sister around, who was always so advanced in her speech, but partly it is also because you are you. You will get there in your own time and I am not worried about you- you are perfect in every way and if when it comes down to it we need to help you a little bit in that department, then we will do so. But it is coming on in leaps and bounds and you express yourself in other ways so well. The main thing I want to say about you right now, to tell you about so you will know when you are older, is just what an incredibly easy going, laid back and good girl you are. I know you are mine, but I have never met such a good girl. You are quite simply no trouble whatsoever. When it is just us at home, when Mads is at school, we have so much fun together. We go out with Grandma, or to meet friends at soft play, or we potter around the house together. Sometimes I have to remind myself to go and play with you, as you could play with your little toys for hours upon end. Whereas your sister can’t really entertain herself for more than ten minutes, unless she is doing arts and crafts, and even then we have to constantly engage with her, you are quiet, happy and just love to play with your toys. In fact you are a little bit of a solitary little girl, not in a bad way or an unsocial way, you just love your own company. You sit there for ages immersing yourself in imaginative games, you play superheroes, or lego, or trolls, and you love it. You also still love to go and have a nap in the afternoon, I never have to force you to go, you just wander up to your bedroom, get into your bed and either sleep if you are feeling tired, or just have some quiet time up there with your toys. When Mads is around, she brings out a cheekier side in you, she brings out your louder side and your more feisty one. You love to giggle and laugh and run around with your sister, and because she is less of a one for playing with toys, preferring more physical games that involve running about, or being spies or superheroes, you enjoy this side with her a lot. You argue like cat and dog, some days you can bicker non stop from the moment we wake up, but for the most part you are the best of friends and I love watching you together. You can tell just how much you idolise your big sister and it is a lovely thing to witness. You both live for your weekend sleepovers, in fact it has been half term this week and you have slept in the same bed all week. It is very sweet to see you enjoy something so much and I hope that you remember these days growing up. In fact I said to your Daddy just earlier today that you are both at a really lovely age to be together, your 26 month age gap seems to have shortened and you both are the best of friends. I feel so privileged that I have given you both the gift of one another and I hope that you always remain close, it sounds silly but I can’t wait to see what the future brings for you as you grow together. But you don’t just have a big sister, you have a little brother too. A little brother who you absolutely adore. While with Mads, you do bicker and fight and get on each others nerves, like sisters inevitably do from time to time, your little brother hasn’t seen that side yet. Both of you dote on him, love him and care for him and it is only getting better as you get bigger. You constantly want to hold him, play with him, and when you sit at the table having lunch he will make a funny noise and he will copy it, which only makes you both laugh and giggle together. You are the sweetest big sister and often when he is crying you will go and find his ‘muzzy bunny’ from upstairs to give to him to make him feel better. In fact your big sister was crying the other day, which rarely happens as neither of you cry often at all, and you went and got her Pongo for her- that’s just part of your nature, you are incredibly kind. You definitely are a quirky little character at the moment. You seem to be a bit of a ‘tomboy’ like your sister, but you have a girly side too. You will still let me dress you in dresses, as long as they are ‘cool’ ones, nothing too twee or girly. You love Trolls at the moment, but at the same time you love superheroes. You got a Batman costume for Christmas from your Uncle Mark and he recently bought you a Spiderman one for your birthday, and so you love dressing up in them. You love nothing more than coming home from a morning out and going upstairs and putting on some combination of pj’s, or one of your many superhero t-shirts. You love a lazy day, every day you ask me whether we can ‘stay at home’- you are happiest in your comfy joggers or pj’s, playing with your toys. You always ask me if today is a nursery day, you always look grumpy when on a Tuesday or Thursday I tell you that it is, but you never cry once I drop you off. You love in the evenings once you are in bed to give us a ‘kiss, cuddle, squeeze’ goodnight. We have been doing this for years, but recently instead of a kiss you will lick me. Every night we do this and every night I pretend to be surprised, and you giggle hysterically every time like it’s the funniest thing ever. You have the cheekiest and naughtiest laugh and it makes me smile ever time I hear it. I could quite simply talk about you forever, but I ought to stop writing now. You are the most lovely, chilled out and sweet little girl, with the widest smile, the most beautiful curls and with the loveliest attitude. 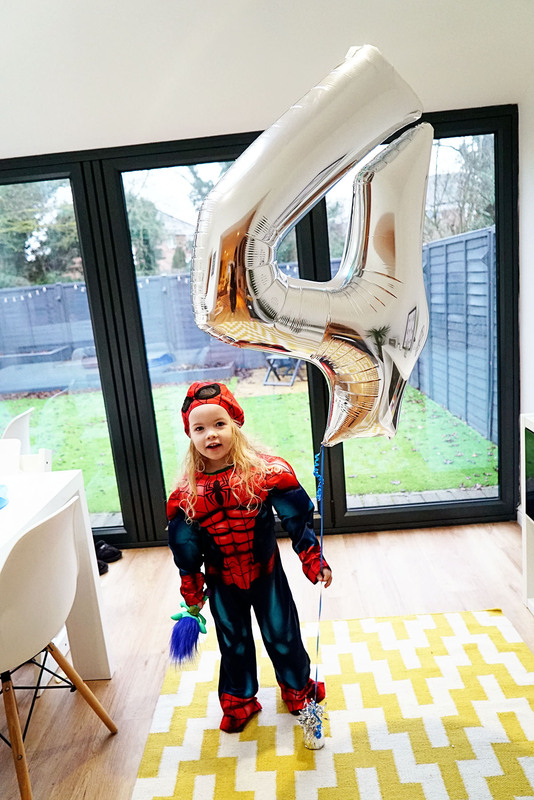 I still find it hard to fathom that you are four, especially because you seem so little for your age, but yet at the same time you are on the cusp of starting school in September. I thought I would be ok about you starting school, I thought that it would be emotional with Mads because she was the oldest and we hadn’t done it before, and emotional with your brother because he was the baby, but I can already feel myself feeling so sad about letting you go. You were supposed to be going into nursery on a Friday for an extra session, just like Mads did, to get you more ready for school, but I wasn’t ready so I have put it off until May time. Come September you will be gone from me for 5 days straight, so I am going to relish these last few months as much as I can. The other day Daddy joked to me that ‘ you were his favourite’ at the moment. Of course that isn’t true, we love you all exactly the same, but you are definitely the biggest joy to be around at the moment. You are easy, you go with the flow and you brighten all our days. You are the filling to our little sandwich and that makes you very special indeed. Check out the rest of my ‘letters to my littles’ here. What a beautiful post and HAPPY BIRTHDAY LOTTIE!!! !